Great tile can really bring a room together except for when its dingy and grimy. When that’s the case, tile can be an eyesore that makes you feel like you don’t want to take your shoes off when walking on it. Tile and grout can be prone to retaining dirt and grease deposits that can mar and darken the once bright, clean colors of your floor. Kinney’s has the skills, experience and tools needed to bring the shine back out of your tile - so you can enjoy it again. Every cleaning process begins with a detailed inspection to determine the level of soiling and any areas that might require some extra attention. We also plan a path for the hoses used by our machinery to make sure we account for any corners that may require protection, so we can place our corner guards strategically to ensure your walls are protected. Once this is done, we begin scrubbing the trouble spots identified during inspection and grout lines if necessary with high-tensile brushes and special solvents designed to break up the bonds formed between dirt and grease and your floor. After these spots have been eradicated, we move onto general cleaning of the tile which involves the use of a rotary power-scrubber equipped with a specialized brush head that is tough on dirt but gentle on your tile. The tile is thoroughly scrubbed and then we use our high-powered vacuum water extraction tool to rinse the tile and extract the dirt in liquid form. After extraction is finished, we mop the floor with a neutralizing agent that cleans up and, well, neutralizes the chemicals used in the process. This process has been proven to result in beautiful, hygienic tile that you can be proud of owning. 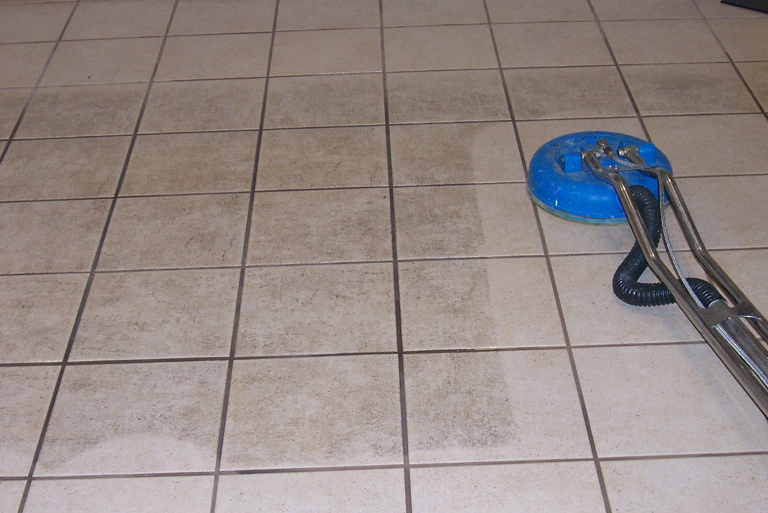 Kinney’s provides a deep tile cleaning service that doesn’t just cover up the grime but removes it completely. Our process is gentle on tile but tough on dirt. Not only does the cleaning process remove the source of spots and stains, but it also removes household allergens which can negatively impact the air quality of your home. We have decades of experience behind us and the know-how that comes with that experience to guarantee your satisfaction with our results. Rubber soles can leave behind skid marks that create eye-grabbing black streaks across your tile. Our expert technicians know how to identify and eradicate these unsightly marks with ease. Grease from the kitchen and your feet. The kitchen is especially prone to grease staining due to all the cooking and foot-traffic that takes place throughout the day. We know how to get that grime off your floor and make it look brand new again. Pet potty accidents and dirty paws. We all love our pets, but they sure do know how to make a mess sometimes. Our professional technicians can have those pesky pet stains out in two shakes. We provide top-notch services at reasonable rates that have kept customers coming back for years. You don’t have to take our word for it though! Kinney’s Carpet Care has been a Better Business Bureau accredited business with an A+ ranking for over a decade. Customers seem to agree as well – we are very proud to have a Five Star Rating full of satisfied customer reviews on Yelp. Your satisfaction is our primary goal, and we have the utmost confidence in our ability to deliver on our promises. Let us show you why we have been a trusted provider of tile cleaning services in Tahoe for over two decades. Call or fill out a request form now so we can schedule an appointment and get your tile shining bright like a diamond.